We all had a go at making paper cranes and planes when we were kids, but some skillful creatives are taking origami to another level. 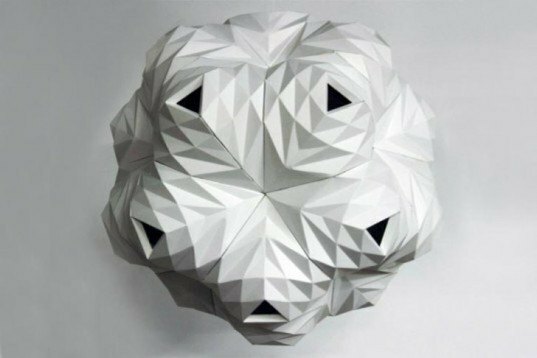 This ancient artform started in 17th century Japan and is based on creating 3D sculptures from folding a flat piece of material -- usually paper -- without the need for glue. 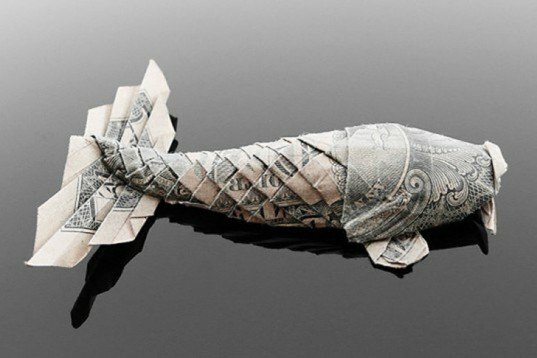 From amazingly tiny origami animals to intricate origami money sculptures, we can't get enough from the simple yet surprising technique of folding paper. Read on for all of our favorite examples! 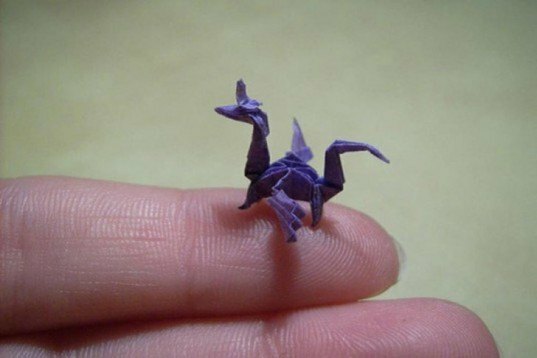 German artist Anja Markiewicz makes tiny origami figures from pieces of paper that are less than an inch long. Using a toothpick, her skilled hands and a load of patience she creates nano-origami cranes, dragons, flowers and snowflakes that are small and beautiful. Japanese industrial designer Yuya Ushida has her own studio design studio were she creates all sorts of experimental objects that make people happy. Her Paper Tea Set is a magical collection of different tea elements made from a single sheet of folded coated paper and judging by the picture we can see it works without spilling a drop! Takuyi Hori is a Japanese graduate of Kanazawa College of Art who seeks to create awareness about endangered species. 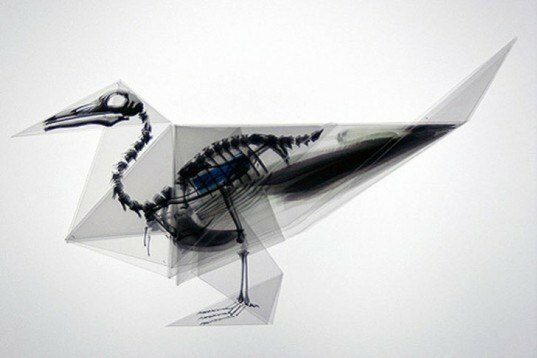 He uses folded translucent paper with animal skeletons printed on it to create x-ray origami that are beautiful and have a strong environmental message. British studio Lazerian uses the ancient Japanese art to give an intricate edge to their lightning collection. By laser-cutting and hand-folding paper they are able to create the most beautiful lamps that take the shape of distant stars. The German University of the Arts in Bremen created an innovative way for displaying digital information within the library’s staircase. Using large-scale origami paper panels as a screen, they can project all sort of information communicating with students in a fun and very cool new way. Using some spare US dollars folded by the ancient Japanese technique, Craig Folds Five creates some intricate origami money. From an original fisherman on a boat to an intricate koi fish, this US-based artist forces us to consider our relationship with money, and crafts. 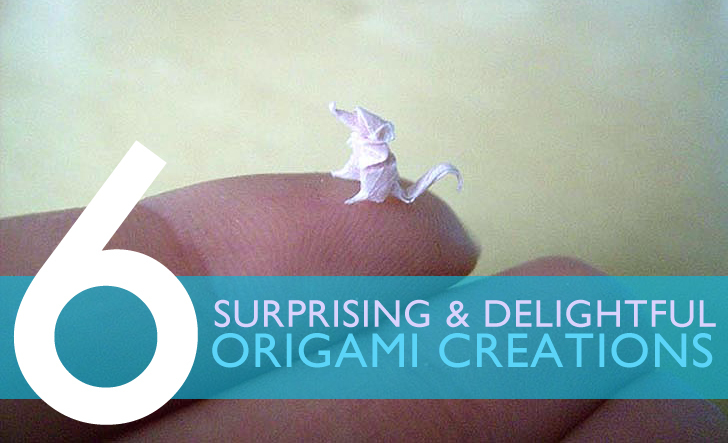 I would like to learn about the practical implications of origami and how it can be applied to innovative new designs. ie The miura ori fold used in the solar panels of satellites, or the water-bomb base fold found in heart stints. In my senior thesis, that you featured on your site last month, I used origami to create a glue-free packaging box for LED bulbs, made completely out of paper. The intention was to raise awareness in the amount of single-use plastic we put in packaging. As a young designer, I think there is something very valuable that we can take away from the idea of origami and paper engineering. How can we use 100% biodegradable mediums to eradicate the need for wasteful plastics? Japanese industrial designer Yuya Ushida has her own studio design studio were she creates all sorts of experimental objects that makes people happy. 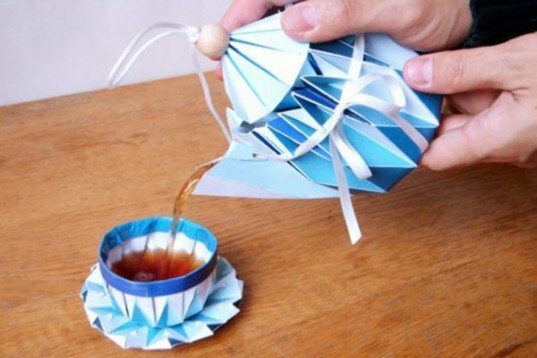 Her Paper Tea Set is a magical collection of different tea elements made from a single sheet of folded coated paper and judging by the picture we can see it works without spilling a drop! Takuyi Hori is a Japanese fresh graduate from Kanazawa College of Art seeks to create awareness on endangered species. He uses folded translucent paper with the animals' skeletons printed on it to create x-ray origami that are beautiful and have a strong environmental message. The German University of the Arts in Bremen created an innovative way for displaying digital information within the Library's staircase. 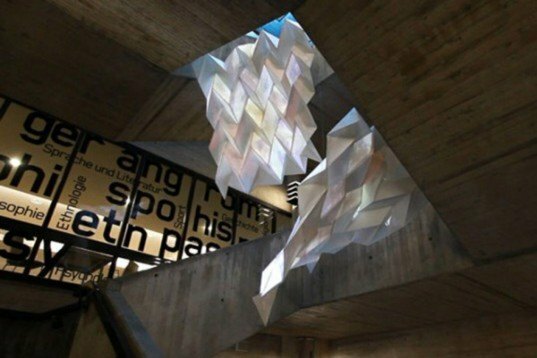 Using large-scale origami paper panels as a screen, they can project all sort of information communicating with students in a fun and very cool new way.